Like BSBO on Facebook for daily updates and photos from our Navarre Marsh Banding during spring and fall migration. And visit the BSBO Bird Bander's Blog for more detailed information. This long term study to monitor the population status of neotropical migrants and to better understand the relationship between in-route habitat and their breeding ecology is conducted on the Ottawa National Wildlife Refuge complex, Creek Bend Sandusky County Park, on neighboring lands in SE Michigan, and at the Nature Center at Shaker Lakes. Constant-effort mist netting and point counts are conducted at each site to document the spatial and temporal use of the habitats by different birds. Data has been used to develop the Lake Erie Management Plan, Beneficial Wildlife Impairments section of the Clean Water Act. It has been widely used for local and regional management plans. From this long term data set, timing of different species has been identified to assist the public in improving their opportunities to view their desired species. The importance of studying avian migration and stopover habitat needs have greatly increased over the past two decades as tropical deforestation and temperate forest fragmentation expands. Little information is known about the "problem" migrants contend with along their migratory routes (Morse 1980), not to mention the transition between spring migration and the breeding period. To offset the energetic costs of migration, birds deposit substantial lipid reserves which may reach 50% body weight among long distance intercontinental migrants (Berthold 1975). As lipid stores are depleted during migration, free living birds are capable of replenishing reserves in a few days at rates approaching 10% body weight per day (e.g. Barlein 1985; Biebach et. al. 1986; Moore & Kerlinger 1987). Whereas these lipid deposits are obviously critical for a successful migration, they may also provide a selective advantage to the migrant with energy reserves remaining (see Sinclair 1983; Ojanen 1984; Krapu et. Migrating and resident passerines are sampled on the Navarre, Darby, Ottawa units of the Ottawa National Wildlife Refuge. Spring migration operation begins mid-April and continues through mid-June. 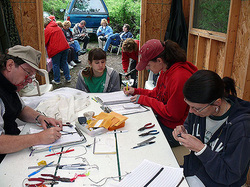 Fall migration banding is conducted August 1 to late October. The Navarre station is monitored daily while the other stations are manned when adequate personnel are available.Birds are captured utilizing 2.6 x 12 meter mist nets. All birds are aged, sexed, banded, measured, body mass recorded, and visually inspected for subcutaneous fat deposits using a 6-point ordinal scale (Helms & Drury 1960). Weather data is compiled from hourly readings of Toledo Edison's Davis Besse Nuclear Power Station. Research by Black Swamp Bird Observatory has identified major movements of passerines that occur roughly the same time each year. These "waves" of migrants, are associations of species that migrate the same time each year. Day-length is the primary driver of spring migration with weather "tweaking"actual arrival dates. Each wave generally have two pulses each approximately a week apart. Normal weather patterns include low pressure cells crossing the southern part of the continent with large movements in Ohio when the cell is in Oklahoma-Arkansas. This results in tropical warm fronts rotating warm winds up the Mississippi and Ohio river valleys. It generally takes a pressure cell about a week to cross the country. Expected large neotropical waves arrive in three general movements. al. 1985; Krementz & Ankney 1987). Adequate stopover habitat may play an important role in delivering migrating passerines to their breeding grounds with sufficient energy reserves to successfully nest. The first wave dominated by male White-throated Sparrow, Hermit Thrush, male Myrtle Warbler, and male Ruby-crowned Kinglet occurs around 25 April. Sub-dominant warblers include the Black-throated Green, Black-and-white, and Nashville. This first wave has been named the "overflight" wave as several more southern species of warbler get caught up in strong southwest winds and over shoot their normal range, resulting a gradual filtering back to the south. The second wave, known as the big wave, occurs 7-13 May and is represented by the greatest species diversity of the spring and is dominated by female White-throated Sparrow, Swainson's Thrush, female Myrtle Warbler, female Ruby-crowned Kinglet, and male Magnolia Warbler. The second pulse of this wave coming five to seven days after, usually has the largest volume and contains the same species dominants. The third wave normally comes around Memorial Day weekend and is dominated by female Magnolia Warbler, American Redstart, Mourning Warbler, vireos, and flycatchers.